Influenced by bands from the German and UK electronic scene, Dirk Ivens (synths & voice) formed ABSOLUTE BODY CONTROL early 1980, and was joined by Mark de Jonghe (synths) and Veerle de Schepper (backing vocals). After releasing a track on the "Blitzpop 1" compilation and the release of their first 7" single "Is there an exit?" (1981), wich became a local underground hit, Mark leaves the band. Eric van Wonterghem, who was in fact a spectator at the first ABC concert, filled in the gap and became Dirk's new musical partner for years to come. Before they decided to go on as a duo, ABC already appeared on several compilation albums and tapes worldwide. Soon ABC became one of the first Belgian electronic acts who proved to be succesfull also on stage. 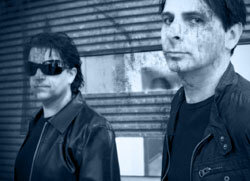 In 1984 Dirk became a member of "The Klinik", followed by Eric who left after the 2nd album to form Insekt. In 1989 they released their last tape "Tracks" wich contained all ABC compilation contributions so far, but the band was put on non active well before. However, the public intrest was still there and resulted in the release of the ABC cd "Eat this" (1993) on the German VUZ records. Many people re-discovered the band and ABC releases became much sought after collector items. Still, it took them over 22 years to reform. Meanwhile, their entire back catalogue is available through Tarantulla (Lost/Found) and Vinyl on Demand (Tapes 81-89). With the release of the "Wind(re)Wind" album wich contains newly recorded versions of their best tracks so far , the brandnew EP "Never Seen" , containing a remix of The Horrorist and the 7 inch "Blue Monday/Warm Leatherette" the future is open.